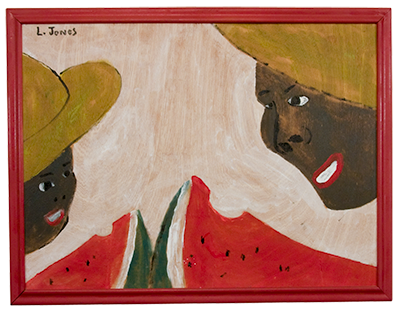 We were first introduced to the naive paintings of Leonard Jones at an auction of "private collections" in April 1996 at Kimball Sterling in Johnson City, Tennessee. Creative as a child, he painted and built primitive home made toys. Although poor, he remained in school and graduated from high school. The local pulp and paper industry provided him with access to work as a lumberjack. 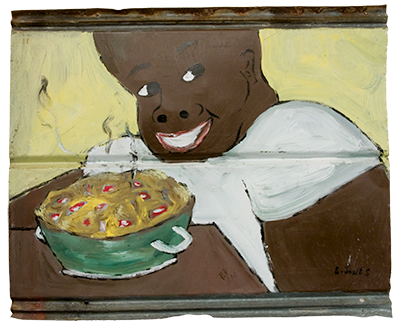 His oil on tin and sometimes plywood paintings depicted an honest and personal portrayal of blacks in the South prior to integration. We purchased these two Jones paintings at that auction; drawn to their naivete and innocence.